Fatah leader Mahmoud Abbas is in Europe this week seeking to convince the Spanish and Norwegian governments to support the Palestinian bid to sidestep negotiations with Israel and have the UN General Assembly recognize Palestinian sovereignty over Judea, Samaria and Jerusalem in addition to Gaza. The Palestinians know that without US support, their initiative will fail to gain Security Council support and therefore have no legal weight. But they believe that if they push hard enough, Israel’s control over these areas will eventually unravel and they will gain control over them without ever accepting Israel’s right to exist. Fatah’s UN gambit, along with its unity deal with Hamas, makes clear that the time has come for Israel to finally face the facts: There are only two realistic options for dealing with Judea and Samaria. Either the Palestinians will take control of Judea and Samaria, or Israel will annex them. If the Palestinians take control, they will establish a terror state in the areas, which – like their terror state in Gaza – will use its territory as a starting point for continued war against Israel. It isn’t only Israel’s experience with post-withdrawal Gaza and South Lebanon that make it clear that a post-withdrawal Palestinian-controlled Judea and Samaria will become a terror state. The Palestinians themselves make no bones about this. In a Palestinian public opinion survey released last week by The Israel Project, 65 percent of Palestinians said they believe that they should conduct negotiations with Israel. But before we get excited, we need to read the fine print. That is, 66% of Palestinians believe “peace” talks with Israel should be conducted in bad faith. Moreover, three-quarters deny Jewish ties to Jerusalem, and 80% support Islamic jihad against Jews as called for in the Hamas charter; 73% support the annihilation of the Jewish people as called for in the Hamas charter on the basis of Islamic scripture. As bad as Israel’s experience with post-withdrawal Gaza and South Lebanon has been, Israel’s prospects with a post-withdrawal Judea and Samaria will be far worse. It isn’t simply that withdrawal will invite aggression from Judea and Samaria. It will invite foreign Arab armies to invade the rump Jewish state. Unlike the post-withdrawal situation with Gaza and South Lebanon, without Judea and Samaria, Israel would not have the territorial depth and topographical advantage to defend itself from invasion from the east. Moreover, the establishment of the second Palestinian terror state after Gaza in Judea and Samaria would embolden some of Israel’s Arab citizens in the Galilee and the Negev as well as in Jaffa, Lod, Haifa and beyond to escalate their already declared irredentist plans to demand autonomy or unification with whatever Palestinian terror state they choose. Living under the constant threat of invasion from the east (and the south, from a Muslim Brotherhood-controlled Egyptian army moving through the Sinai and Gaza), Israel would likely be deterred from taking concerted action against its treacherous Arab citizens. As then-prime minister Ariel Sharon warned in 2001, the situation would be analogous to the plight of Czechoslovakia in the 1930s. Just as the Nazis deterred the Czech government from acting against its traitorous German minority in the Sudetenland in the 1930s, so Arab states (and a nuclear Iran), supporting the Palestinian terror states in Judea and Samaria and in Gaza, would make it impossible for Israel to enforce its sovereign rights on its remaining territory. Israel’s destruction would be all but preordained. The second option is for Israel to annex Judea and Samaria, complete with its hostile Arab population. Absorbing the Arab population of Judea and Samaria would increase Israel’s Arab minority from 20% to 33% of the overall population. This is true whether or not Israel grants them full citizenship with voting rights or permanent residency without them. Obviously such a scenario would present Israel with new and complex legal, social and law enforcement challenges. But it would also provide Israel with substantial advantages and opportunities. Israel would have to consider its electoral laws and weigh the prospect of moving from a proportional representation system to a direct, district system. It would have to begin enforcing its laws toward its Arab citizens in a manner identical to the way it enforces its laws against its Jewish citizens. This includes everything from administrative laws concerning building to criminal statutes related to treason. It would have to ensure that Arab schoolchildren are no longer indoctrinated to hate Jews, despite the fact that according to the Israel Project survey, 53% of Palestinians support such anti-Semitic indoctrination in the classroom. These steps would be difficult to enact. On the other side, annexing Judea and Samaria holds unmistakable advantages for Israel. For instance, Israel would regain complete military control over the areas. Israel ceded much of this control to the PLO in 1996. The Palestinian armies Israel agreed to allow the PLO to field have played a central role in the Palestinian terror machine. They have also played a key role in indoctrinating Palestinian society to seek and work toward Israel’s destruction. By bringing about the disbanding of these terror forces, Israel would go a long way toward securing its citizens from attack. Furthermore, by asserting its sovereign rights to its heartland, for the first time since 1967, Israel would be adopting an unambiguous position around which its citizens and supporters could rally. Annexation would also finally free Israel’s politicians and diplomats to tell the truth about the pathological nature of Palestinian nationalism and about the rank hypocrisy and anti-Semitism at the heart of much of the international Left’s campaigns on behalf of the Palestinians. No, annexation won’t be easy. But then again, the alternative is national suicide. And again, these are the only options. Either the Palestinians form a terror state from which it will wage war against the shrunken, indefensible Jewish state, or Israel expands the size of the Jewish state. Since 1967, Israel has refused to accept the fact that these are the only two options available. Instead, successive governments and the nation as a whole have set their hopes on imaginary third options. For the Left, this option has been the fantasy of a two-state solution. 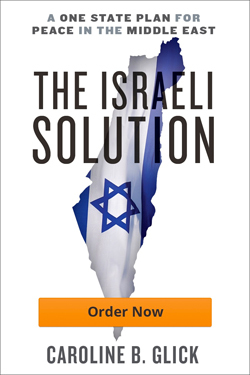 This “solution” involves the Palestinians controlling some or all of the lands Israel took over from Jordan and Egypt in the Six Day War, establishing a state, and all of us living happily ever after. lming, consistent and violent support for the destruction of Israel in any size, this leftist fantasy never had a leg to stand on. And since 1993, when the Rabin government adopted the Left’s fantasy as state policy, more than 2,000 Israelis have been killed in its pursuit. Not only has the Left’s third option fantasy facilitated the Palestinian terror machine’s ability to kill Jews, it has empowered their propaganda war against Israel. Israel’s pursuit of the nonexistent two-state solution has eroded its own international position to a degree unprecedented in its history. Last week’s meeting of the so-called Middle East Quartet ended without a final statement. It isn’t that its members couldn’t agree on the need to establish “Palestine” in Judea and Samaria and Jerusalem. That was a no-brainer. The Quartet members couldn’t agree on the need to accept the Jewish state. Russia reportedly rejected wording that would have enjoined the Palestinians to accept the Jewish state’s right to exist as part of a peace treaty. And this was eminently foreseeable. The unhinged two-state solution makes Israel’s legitimacy contingent on the establishment of a Palestinian state. And it put the burden to establish a Palestinian state on Israel. Since everyone except Israel and the US always accepted the establishment of a Palestinian state, and no one except Israel and the US always accepted the existence of the Jewish state, by making its own legitimacy dependent on Palestinian statehood, Israel started the clock running on its own demonization. The longer Israel allows its very right to exist to be contingent on the establishment of another terror state committed to its destruction, the less the nations of the world will feel obliged to accept its right to exist. As for the Right, its leaders have embraced imaginary third options of their own. Either Jordan would come in and save us, or the Palestinians would come to like us, or something. The one thing that both the Left’s fantasy option and the Right’s fantasy option share is their belief that the Palestinians or the Arabs as a whole will eventually change. Both sides’ imaginary third options maintain that with sufficient inducements or time, the Arabs will change their behavior and drop their goal of destroying Israel. Our 44-year dalliance in fantasyland has not simply weakened us militarily and diplomatically. It has torn us apart internally by surrendering the debate to the two ideological fringes of the political spectrum. Actually, to be precise, we have surrendered 99% of our public discourse to the radical Left and 1% to the radical Right. The Left’s control over the discourse has caused its ideological opposite’s numbers to increasingly disengage from the state. That would be bad enough, but the Palestinians’ inarguable bad faith and continued commitment to Israel’s destruction have driven the far Left far off the cliff of reason and rationality. Unable to convince their fellow Israelis that their two-state pipe dream will bring peace, the Israeli Left has joined forces with the international Left in its increasingly shrill campaigns to delegitimize the country’s right to exist and undermine its ability to defend itself. This sorry state of affairs is exemplified today by the radical Left’s hysterical response to the Knesset’s passage last week of the anti-boycott law. The comparatively mild law makes it a civil offense to solicit boycotts against Israel. It bars people engaged in economic warfare against Israel from getting government benefits and makes them liable to punitive damages in civil suits. The Left’s hysterical public relations campaign to demonize the law and its supporters as fascists and seek its overthrow through the Supreme Court makes clear that the Left will wage war against its own country in pursuit of its delusion. But aside from driving the public discourse into the depths of ideological madness, Israel’s embrace of fantasy has made it impossible for us to conduct a sober-minded discussion of our only real options. The time has come to debate these two options, choose one, and move forward.